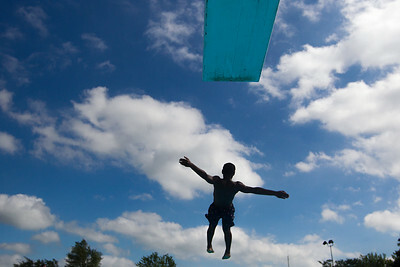 Sarah Nader- snader@shawmedia.com Keith Webb, 14, of Woodstock jumps off the high dive at the Woodstock Water Works Monday, July 13, 2015. 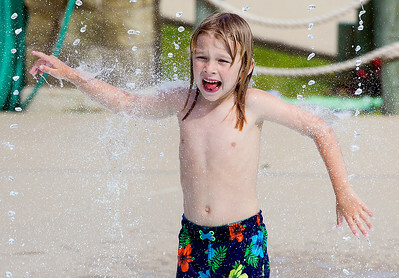 Sarah Nader- snader@shawmedia.com Trevor Zielinski, 7, of Woodstock beats the heat while swimming at the Woodstock Water Works Monday, July 13, 2015. According to the National Weather Service Tuesday's forecast is expected to have a 50 percent chance of showers and thunderstorms, mainly after 10 a.m. and partly sunny, with a high near 83 degrees. Keith Webb, 14, of Woodstock jumps off the high dive at the Woodstock Water Works Monday, July 13, 2015.